You probably already know the importance of creating a financial strategy that covers the cost of food and clothing. But did you know that it is equally vital to plan ahead for the inevitable household expenses that arise? 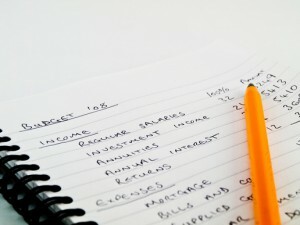 Read on to get an idea of what to consider as you make a household maintenance budget. As with any major undertaking, the first step is preparation. That means putting anywhere from 1 to 3 percent of your home’s purchase price aside in a bank account to cover expected and unexpected expenses. For example, if your home cost $400,000, set aside $4,000 annually. You can carry over any remainder into next year. Periodically, take stock of your needs and plan accordingly. If you suspect you might need a new roof or hot water heater in the next few years, start saving now. Doing so will cushion the blow of a large expense down the line. Do all you can to keep ongoing costs down. One of the most effective ways to accomplish this is by conserving energy. Turn lights off when you’re not using them; keep your home at a moderate temperature, not too hot or too cool. Perhaps most important, buy appliances that are energy-efficient by getting only those that are Energy Star-certified. Speaking of appliances, don’t take them for granted. Although they are designed to last several years, issues can and do happen. Lessen the likelihood of the “I need someone to fix my appliance at midnight on a weekend” emergency by properly maintaining your dishwasher, refrigerator, dryer, washer and range according to manufacturer specifications. In addition, use your annual household maintenance stockpile of cash to repair or replace defective machines, using well-trained technicians for repairs and replacing appliances only with efficient, Energy Star models. While your household electronics might require the repair services of a professional, you can keep other costs down by doing some household tasks on your own. Of course, this depends on your degree of comfort and familiarity with tools, user guides, pipes, tiles, etc. Just remember that you will most likely save a great deal of money if you take on some basic maintenance tasks yourself instead of paying someone top dollar in labor costs. Finally, use your resources wisely. If at all possible, avoid opening a home equity loan or getting additional credit cards to accomplish home improvement tasks. Instead, plan ahead, budget well and take on projects as you can afford them. Few of us actually enjoy sitting down and creating a budget. However, once you have spent the time to strategize when it comes to your household expenses, you can definitely breathe a sigh of relief. At last, you can control home maintenance costs instead of having them run your life.